JACOB'S CREEK LIFT STATION SEWER INTERCEPTOR PROJECT: The Jacobs Creek Lift Station Sewer Interceptor project includes installation of approximately 5,000 feet of 15-inch gravity sanitary sewers, including trenchless installations at two county roads and at the Jay Run Creek crossing. Basin 7: 2,700 lineal feet of 24-inch relief sewer. Begins at a manhole near Falling Run at the rear of the Padgett property and continues along the creek to E 8th and Jackson Street intersection where it continues on Jackson St to Beeler St and terminates at the intersection of Beeler and E 15th Street. Basin 16 - Division A: 1.6 million gallon underground storage facility and dewatering pump station. Entire project is located at the rear of the St. Mary’s cemetery located at Charlestown Road and Silver Street. Basin 16 - Division B: 4,200 lineal feet of 15 to 24-inch gravity sewer, located off of Silver Street through Carlton, Indiana, Willard, McDonald Ave, and Sanderson. Basin 14: 370,000 gallon underground storage facility. Entire project located in open area at the rear of Gastroenterology of Southern Indiana and Hellenic Center properties on Grant Line Road. Construction of the first project (2,700 feet of relief sewer) began first, followed by construction of the 1.6 MG storage facility, dewatering pump station and the 4,200 feet of gravity sewer. The last of the improvements will be a 370,000 gallon storage facility. All construction should be completed by the end of 2018 and upon completion of these projects the City can begin the 1 year demonstration period to show that all terms of the consent decree have been met and US EPA oversight can be eliminated. 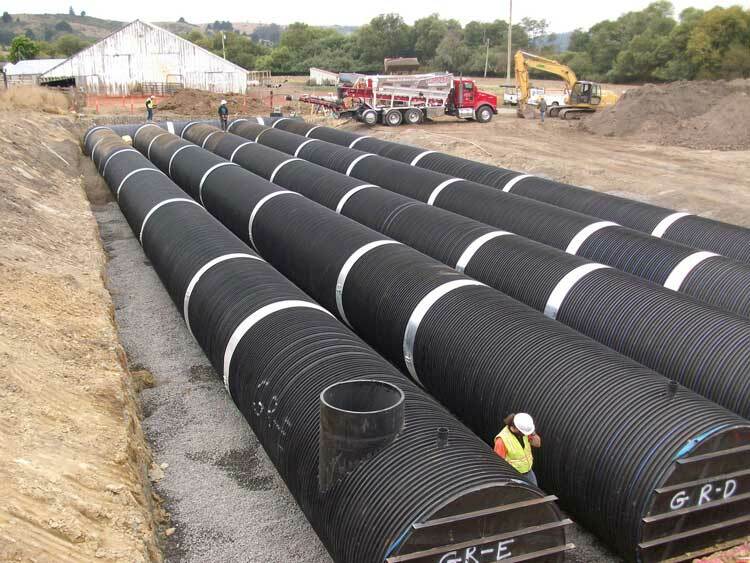 Photo example of the type of storage tanks that will be installed. What will these projects accomplish? In 1992, the Environmental Protection Agency (EPA) demanded that the City eliminate sanitary sewer overflows in the City of New Albany under a Consent Decree. A sanitary sewer overflow (SSO) occurs when untreated sewage is discharged from the system before it reaches the treatment facility. Since 2010, the City of New Albany has made great progress on this front, going from nearly 80 sites where SSOs could occur to only 11 present-day sites. "Unsanitary water coming out of the top of the manhole running in the streets, exposing our citizens to contamination, is not acceptable - period." - Mayor Jeff Gahan. HERE, UNTREATED WATER IS TESTED AT AN SSO SITE TO DETERMINE THE RISK TO PUBLIC HEALTH. As part of the Environmental Protection Agency's 1992 Consent Decree, oversight and final approval of any new development that would tie into the New Albany Sewer System lies with the EPA. This means that the EPA can limit, reduce, or deny economic development projects and growth opportunities for the City. With the growth the City is experiencing and interest in New Albany at an all-time high, we must ensure that we comply with the Consent Decree so that we can continue to promote economic growth in New Albany.